Tlingit artist Alison Marks raised her first totem pole on Saturday in Yakutat, which she carved in memory of her grandfather. She’s one of only a handful of Native women who carve totem poles. Alison Marks was “very aware” when she started carving a totem pole to honor her grandfather that this isn’t a job typically done by Tlingit women. “But it’s part of the evolution of the culture,” she said. Marks has been an active part of that evolution. 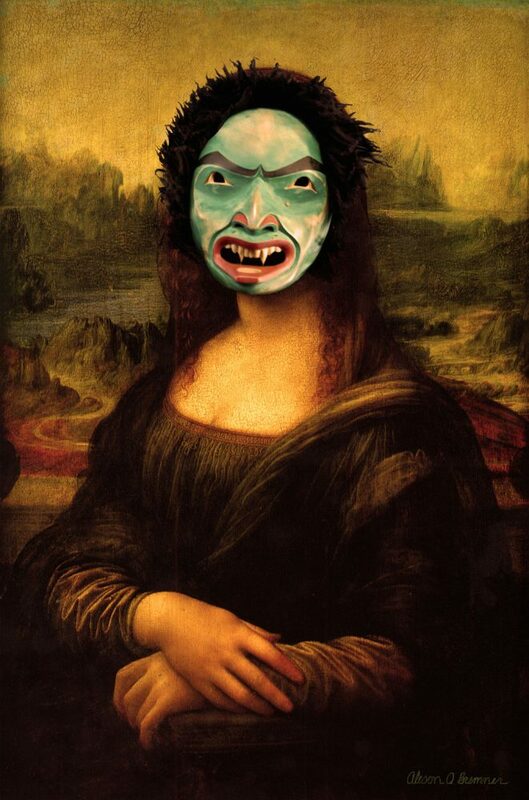 Her artwork often blends traditional Tlingit culture and design with modern ideas. That often ends in humorous cultural collisions like internet memes on a hand drum or a paddle depicting an iconic image of Burt Reynolds lying naked on a bear-skin rug. “I try to incorporate humor in my work to draw the viewer in and hopefully shed some light on some different aspects of the culture that aren’t immediately apparent to people that might not be too familiar with Tlingit people,” Marks said. 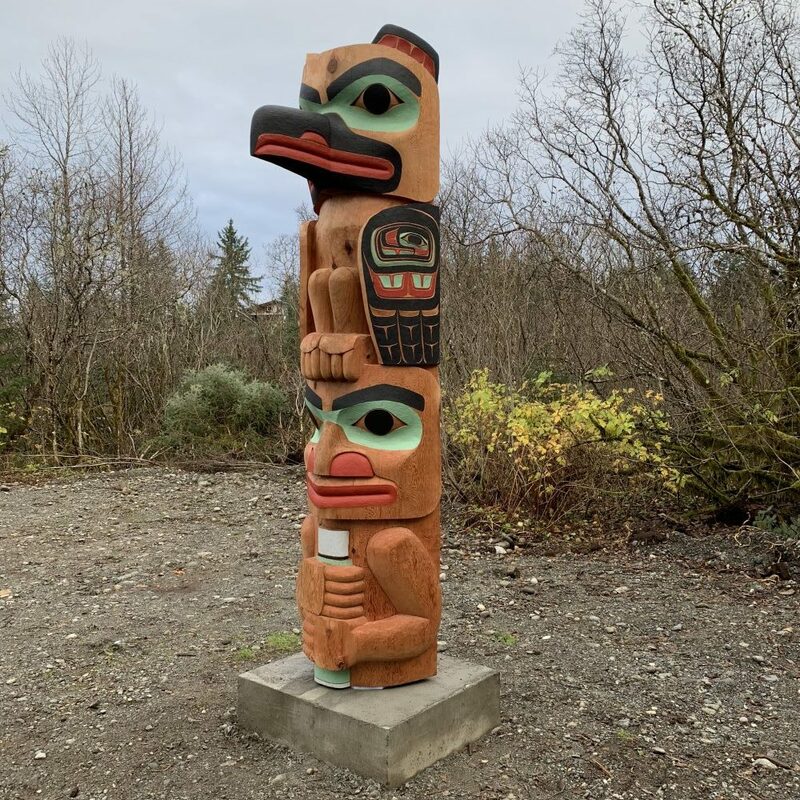 Marks started to work on the totem pole under the guidance of her mentor, David A. Boxley in Kingston, Washington. They chose a 10-foot-tall red cedar that was later shipped to Yakutat. Marks said carving the totem pole took months of hard work. “I was carving in the winter outside in a tent that my father built for me to work in and it would be so cold while I was out there carving that my coffee would freeze in the mug while I was working,” Marks said. The totem pole and the sacred raising ceremony last Saturday commemorated the life of John Bremner Sr. He was born in 1912 and built the house in Yakutat that the totem pole now stands alongside. “He was a great man of that age where he was always helping the community, always really involved. And in my life he really influenced my connection to my Tlingit heritage.” Marks said. When Marks decided to honor her grandfather with a totem pole, she knew she wanted to carve his clan crest and a figure representing him and his coffee-loving personality. “So we put the raven on top and my grandfather just below the raven and my grandfather is holding a thermos of coffee,” she said. Marks says building the totem pole was a transformative experience for her and that she’s honored to have made a totem pole for her grandfather, her family and the Yakutat community. “One of my cousins was saying he can’t to go and have coffee with it, coffee with grandpa who also has his coffee. Marks says she’s itching to create more totem poles alongside her future work. In February, Marks’ latest work will be exhibited in the Anchorage Museum. PreviousCongratulations to Raven Radio raffle winner Gayleen Jacobs!